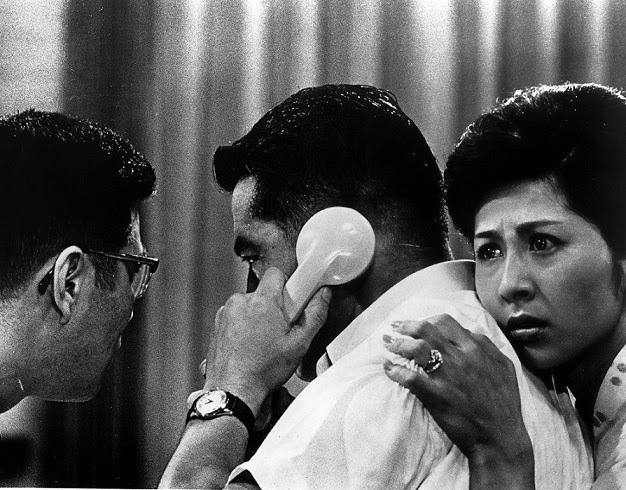 In many ways, High and Low (aka Heaven and Hell) is my favorite Kurosawa film. This film is beautifully acted, raises amazing ethical questions, and provides rather a good bit of suspense. This film is also very accessible as it’s modern in its sensibilities. 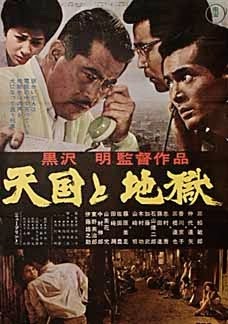 High and Low is the story of Kingo Gondo (Toshiro Mifune), a executive who is making a power play to take over the company for which he works, National Shoes. He is trying to stop the company from shifting to low quality shoes which will cheat consumers and ruin the brand, and he has set up a secret leveraged buyout attempt to take control of the company. To achieve this, he has gambled everything he owns. As his plan heats up, he receives a phone call. His son Jun has been kidnapped and a massive ransom is demanded. Paying this ransom will destroy the leveraged buyout and wipe out Gondo. Nevertheless, Gondo prepares to pay the ransom because it is his son. Then he sees his son playing in the yard. The ransom call has apparently been a hoax. Only, it hasn’t. The kidnappers grabbed Shinichi, the son of Gondo’s chauffeur by mistake. Despite this mistake, the kidnappers still demand that Gondo pay the same ransom. What will he do? I’ll save that for you to discover. Toward the end, by the way, this film becomes a fascinating police procedural which gives you some interesting insight into Japanese culture. This is a fantastic film. And before I say anything else, let me toss out two words that say so very much: Toshiro Mifune. Mifune is, in my opinion, the greatest actor the world has ever produced. He is amazing. He is entirely believable in any role he plays. He has a stunningly noble screen presence, but boils over with emotion just beneath the surface. You feel everything his characters feel as if it were you. He is amazingly physically gifted and he can make complex athletic moves seem as simple as sitting down, yet he can also turn every day motions into intensely meaningful gestures. And he does all of this with a subtle approach that seems impossible. 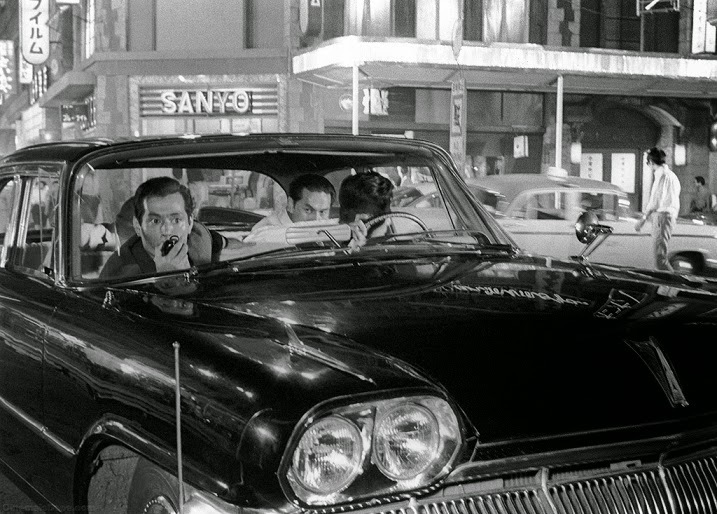 Mifune plays the lead and watching him is truly a joy. He puts you in this film and makes you feel every single punch the script sends his way. He raises this film to a whole new level. Apart from Mifune, this film has a strong script. For one thing, none of the film’s characters are the least bit cardboard. Each character has unique traits. Some are smart and competent. Some are incompetent or careless. Some are opportunists, some are devious, and some are helpless. Each character is given a unique motivation. Even the kidnapper’s motive is examined in depth. This makes this a very real world. Moreover, little in this film happens according to the normal order of events in films like this. It zigs at every opportunity. There is no deus ex machina, nor do characters do stupid things just to drive the plot either. It feels real at every turn. More importantly, however, this is one of the most thoughtful films I’ve ever encountered. Think about the ethical dilemma and how it develops: Gondo is fighting for the life and soul (no pun intended) of the shoe company he loves and has staked all of his assets on it. Unexpectedly, he is confronted with the dilemma of saving his son and losing everything else or losing his son and obtaining everything he wants in his business life. Then suddenly, he learns that it’s not his son who has been kidnapped. But does it matter? Should it? He is the only one who can pay the ransom and if he doesn’t, then the son of his chauffeur will be killed, but can we really put the responsibility on him? Does it matter that he is the reason the man’s son was kidnapped? Does it matter that he was ready to pay to save his son? Is it right or wrong to refuse to save this other man’s son? When word of this leaks out, his supporters face the dilemma of whether or not to stick with a man who is likely to destroy his own plan and ruin their careers or do they turn to the other side? The police face a series of dilemmas as well about how to respond and how far to go to solve this crime without endangering the boy. All of this makes this an amazing film experience, and I won’t ruin it for you by telling you any of the other twists and turns the film takes. This film is intense. It is thought-provoking. It is unpredictable. And driving this film is the amazing acting of Toshiro Mifune, the fantastic script, and the perfect camera work of Akira Kurosawa. I absolutely love this film. Finally, as an aside, I find the pedigree of this film interesting. It is said to be based on the novel “King’s Ransom” (1959) by Ed McBain. However, it is very, very similar to the Glenn Ford/Donna Reed movie Ransom from 1956 (remade by Mel Gibson in 1996). I suspect that McBain may have copied the Glenn Ford movie and somehow this fact has fallen through the cracks. In any event, I recommend giving the Ford movie a peek after you see High and Low, as it too is excellent. Guess I got to put it on my list. For as much as I like to consider myself a film buff, I must confess that I've never seen a Kurosawa movie. (Hell, I've never seen Casablanca all the way through.) Before restorations and digital remastering, older movies in general and older foreign movies in particular were almost unwatchable. They were faded, scratched, dingy, and the subtitles would bleed into the scene so badly that they were virtually unreadable. I'm guessing that the films you're reviewing here look pretty good on DVD or Blu-Ray. Kit, Absolutely. This is one of his best. You shouldn't miss it. Dave, I can't really say that. I don't think anyone has done a restoration on his films. Or if they have, I haven't seen them. So his films very much feel old. That said, I do know they started a restoration on Rashomon, though I don't know the status on that. High and Low doesn't feel particularly old because the films of the 1960s are in pretty good shape. His later stuff, like Ran also are in great shape. But his early 1950s stuff can be hard to watch. Yeah, I have to put this one on my list, too. Andrew, Criterion has pretty much cornered the market on Kurosawa in this country. I must say the screenshots from the Blu-Ray look particularly great. Scott, Criterion does seem to own all of his work in the US, and they did as far back as I can recall. In fact, I've got Criterion DVD's of all of them. But I'm not aware of them doing any sort of restoration on his films. This high-definition digital transfer was created on a Spirit 4K Datacine from a 35mm fine-grain master positive and, for the color sequence, a 35mm interpositive. Thousands of instances of dirt, debris, scratches, splices, warps, jitter, and flicker were manually removed using MTI's DRS system and Pixel Farm's PFClean system, while Digital Vision's DVNR system was used from small dirt, grain, and noise reduction. Well, that's something. :) But the problem really isn't this film. The problem are films like Seven Samurai and Ikiru, which are genuinely hard to watch. Jed, He was excellent in that too. I think he's fantastic. And I definitely recommend this film!